It's true, we get it, the holidays can be tricky! And staying healthy this time of year can be particularly challenging. Family obligations, potlucks, holiday baking and the general chaos of holiday season can get the best of us (despite our good intentions!). Luckily, we have a few tips to help you make it through without compromising your health and nutrition goals! Here are some of our Holiday Health Hacks to help you stay on track! Fuel Up Before The Party! Ensure you’ve fueled your body efficiently ALL DAY! That means starting your day with a balanced breakfast with plenty of protein and healthy fats for sustained energy levels. Make sure to make time for lunch and don’t skip the snacks. As tempting as it might be to skip meals on a party day (whether you’re ‘saving room’ for all the yummy party treats or trying to make sure you fit into that cocktail dress) this technique inevitably backfires and results in overindulging, usually on the least healthy options! Heading to a potluck? Try having a light dinner before you go. A small bowl of soup or salad with lean protein can take the edge off your hunger allowing you to make more conscious choices when faced with overindulgence. We know! There’s no way you can possibly resist your favorite holiday treats! So here’s where we use our discretion. Sure, there’s a lot of delicious food around this time of year, but there’s also a lot of junk. Decide before you arrive what you REALLY want to indulge on and then go for it! But skip out on all the filler. Store bought, nutrient void sandwiches, cakes and cookies are often filled with undesirable additives and preservatives. We recommend you choose several special treats to indulge in (guilt free!) then stick to healthy options to round out the meal. Green salads, roasted vegetables and fruit and veggie platters are great options to fill your plate and your belly. Bring Your Own Healthy Option! No one likes to show up empty handed to a party! So instead of bringing the traditional bottle of wine, dessert or plate of cookies, why not contribute a healthy dish? If the event is a more formal dinner party, contact the host well in advance and offer to contribute a dish. Generally, hosts are happy to oblige as this means less work for them! A first course nutritious soup or salad, a side dish of hearty roasted root vegetables or a low sugar, high fibre dessert are all great options. Heading to a potluck? Just watch what a hit your healthy dish is! People are over the moon when they see delicious AND healthy options. And you might even inspire them to bring their own healthy option to the next party. Don’t Fill Up On Fluids! We know you’re busy. Holiday shopping, social and work obligations, visiting friends and family... these can eat up a lot of your time and the first thing to go is usually our fitness routine. But this often leaves us feeling guilty, anxious and more tired than usual. It’s not all in your head (or not JUST in your head, we should say)! When we exercise our body releases serotonin and other feel good hormones that help us feel happy and relaxed. Science has shown that one of the best ways to cope with stress and increase energy levels is by maintaining a consistent exercise regime. Give yourself the gift of self-care because you deserve it! December’s soothing smoothie is the perfect drink to slow down with this busy holiday season. Made with chocolate almond milk, chai spice, spinach and banana, this delicious cold blend will actually make you feel warm and cozy. Did you know chai is actually a potent immune booster thanks to the cardamom it contains? Since chai also helps to soothe the digestive system and ease nausea this smoothie perfect for those days we may have overindulged! The chocolate almond milk base not only provides some sweetness to balance out the spicy chai flavours but is also a source of healthy fat and protein which helps to keep us full longer. Just to top it all off we even managed to sneak in some leafy greens for an extra boost of vitamins! This month we partnered with the Canadian Centre for Gender & Sexual Diversity, with a portion of the funds also going to the Ottawa Gay Men’s Chorus. In partnership with the CCGSD - we are proud to continue to foster a safe space and will be incorporating inclusiveness in our leadership and staff trainings in the new year. You may also notice that pronoun buttons are present - making it visibly noticeable for patrons or staff to know which pronoun to use when communicating. We are happy to be one of Ottawa’s proud city businesses. The Canadian Centre for Gender and Sexual Diversity (CCGSD) intersectionally promotes diversity in gender identity, gender expression, and romantic and/or sexual orientation in all its forms on a national level through services in the areas of education, health, and advocacy. Their resources and programming can be used to uplift gender and sexual minorities, as well as give the tools to wider populations in building allyship. 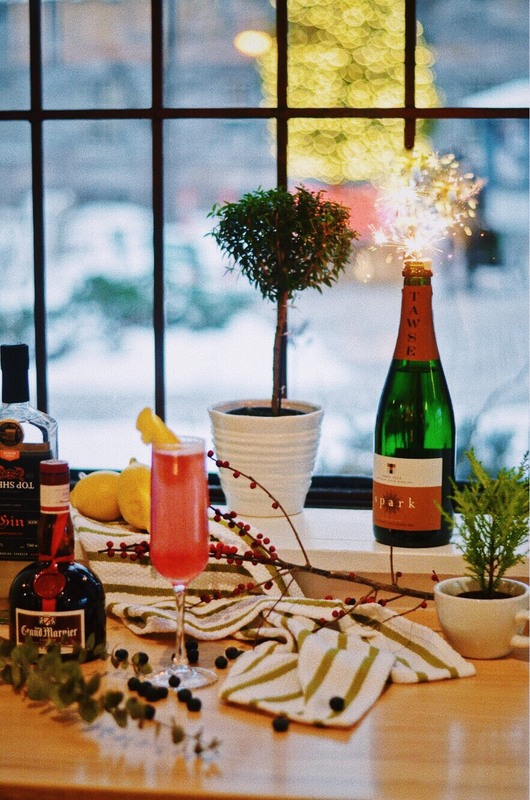 This cocktail is a holiday twist on the classic French 75, perfect for celebrating the solstice or ringing in the New Year. This beverage follows the traditional recipe with some slight variations. It utilizes locally produced Top Shelf Gin, with Grand Marnier, Ontario produced Tawse Spark Riesling, and of course blueberries. Tawse’s Spark is best suited for this drink as it has flavourful hints of lemon zest, honey, and mineral. The Blueberry 75 is a well balanced—yet tastefully tart cocktail, and is something your holiday guests are sure to love. If you’re heading to a holiday party or hosting, our Executive chef and co-owner Olivia Cruickshank has shared this delicious hors d'oeuvre recipe that takes mushrooms on toast to a whole new level. Place 2-3 slices of mushroom on each piece of crostini. Drizzle wasabi mayo over mushrooms. Add a couple of grains of salt on to the mushrooms. Top with a slice of radish and a small twirl of cucumber. Place tamari, pineapple juice, pepper and lemongrass into a blender and combine on medium speed. Add both oils while blender is still running. Place in an airtight container until use. Remove stem and gills from mushrooms. Place into insert and pour marinade over mushrooms and let marinade for a minimum of 4 hours, preferably overnight. Remove mushrooms from marinade and allow any excess marinade to drain off. Grill on charboiler until grill marks form. Place everything into a bowl and whisk until well combined. Gift ideas for the foodie you love! $25 + tax. Purchase a gift card or bag of Little Victories or Fluid coffee to receive the mug for only $20+tax! We take reservations at our Elgin & Westboro locations for groups of five or more by phone. We accept reservations for groups of any size at our Kanata location. PS Our Winter menu has arrived! Pop on by to try some of the new items! And never fear, the Radical cauliflower wings aren’t going anywhere. Check out the new menu here. PPS Our newest Preston location will soon open its doors! Stay up to date on Instagram or Facebook to find out when! This space will serve as both our prep kitchen, and a store front - serving more grab and go menu offerings, along with hot food options (and delicious espresso too).